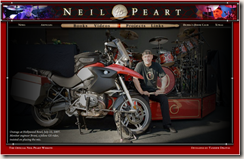 The design of NeilPeart.net has been refreshed to match his Snakes & Arrows drum kit. 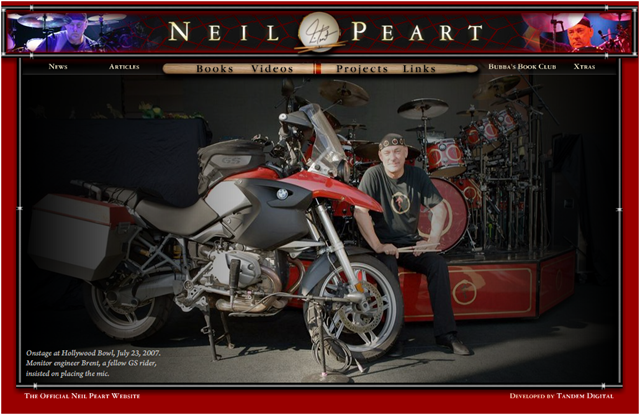 Once you close the splash page (the button is right below Main Monkey Business: Drums-Only, you'll see a nice photo of Neil, his BMW GS motorcycle, and the Snakes & Arrows drum kit on stage at the Hollywood Bowl. While there aren't any significant content changes to report, I did notice the inclusion of Landscapes by Kevin J. Anderson in the Xtras section. While Neil wrote the introduction for Landscapes, the text on the Xtras page is the generic description used on Amazon and other websites. The website still uses Flash technology, which is really not recommended for narrowband connections (although the website has dropped its warning). Dial-up users beware.